Since Publishing this picture and story, much has happened. We were contacted, first by a concerned reader, and then by others on the spot who could help. I wanted to offer the E Mail exchanges below for you to follow the story, but I have now abridged these to respect those involved.. 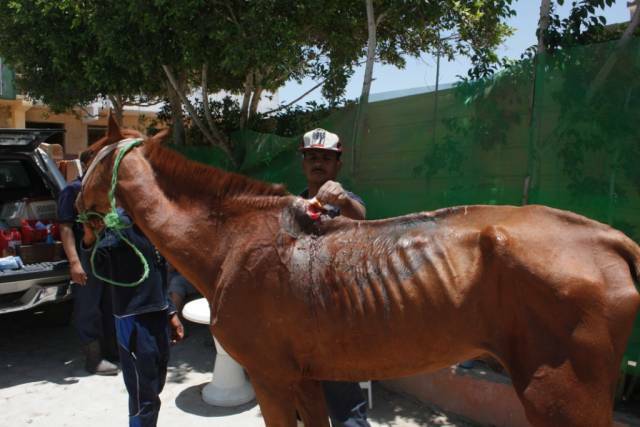 The latest pics follow-on of the horse when it was traced in order to give it emergency treatment. THE PICS ARE STILL NOT FOR THE SQUEAMISH ... BUT THEY ARE REALITY !! We are very grateful for the help we received from the following individuals who also cared enough to take action. 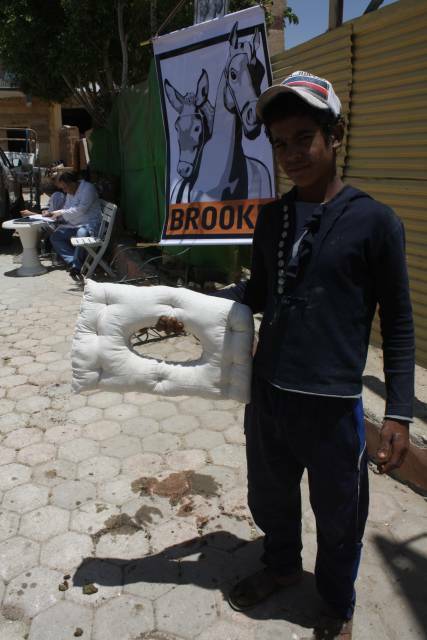 We will be working in the future closely with The Brooke Hospital For Animals - in Cairo. Please take a moment to visit their site and help them directly. It really is a matter of animal life or death. 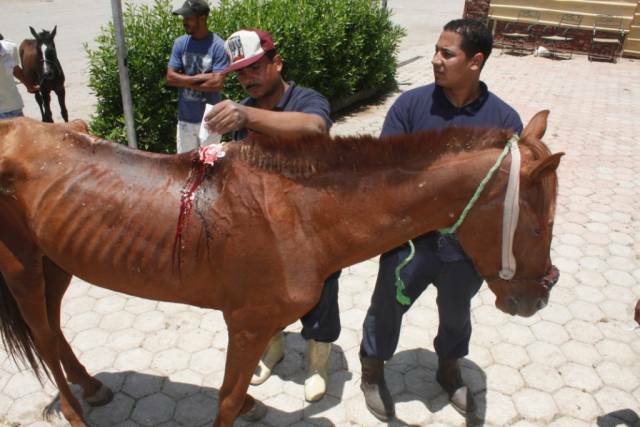 Frances contacted animal help organisations in Egypt to try and illicit their help to trace the injured horse. One organisation contacted was The Brooke Hospital For Animals, who coincidentally hold free hospital clinics in Cairo for the purpose of helping where there is no other hope. Charlotte Galvin, Supporter Care for the Brooke, responded to Frances and contacted Ahmed El Sharkawy, who is the Information and Communications officer for The Brooke. 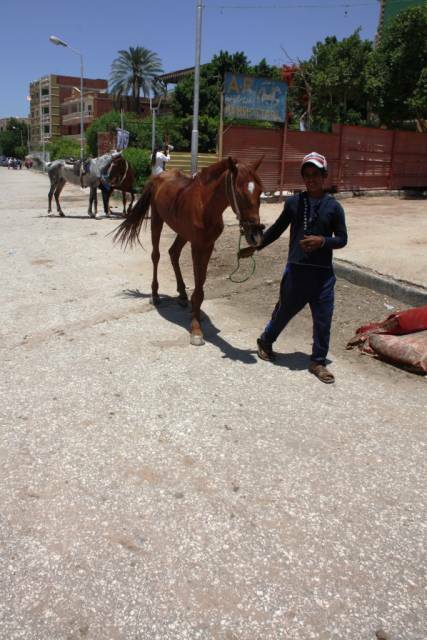 Ahmed EMailed me to try and discover the location of the injured horse. I was able to send Google pics of the exact location because the stable is almost alongside the apartment we use in the village Nazlet El Samaan. The biggest synchronicity is this : While we were there we made firm contact with another organisation working free for the animals. This is called The Egyptian Society of Animal Friends. 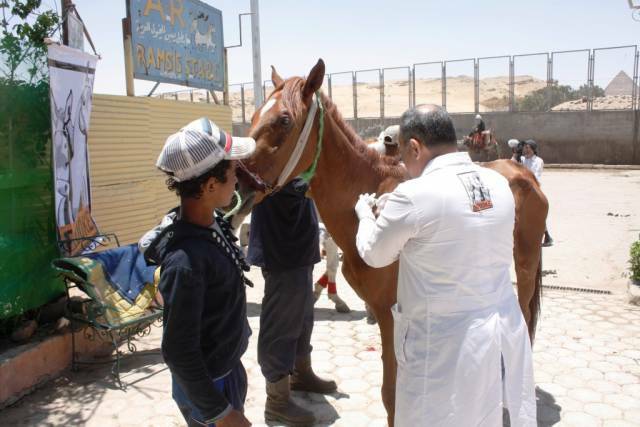 During the week, trainee vets attend a free clinic set up along the Sphinx road. We shared pledges with them to liaise in the future. They were also aware of this particular horse, but their influence to help it had been restricted so far. Ahmed from The Brooke mailed me back to say that their free clinic was now functioning two times a week almost exactly at the location of the horse stable where the badly injured horse could be located. Finally they were able to locate the animal, and despite its very poor condition they were able to administer emergency treatment. 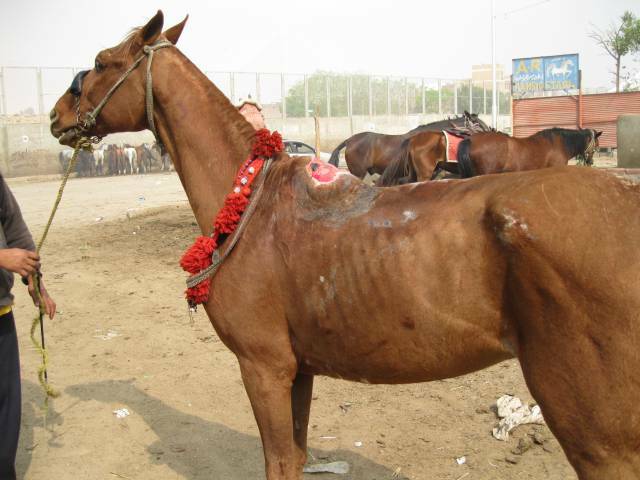 The prospects of the animal improved considerably after The Brooke Vet Dr Nagi skilfully treated the ulceration. Ahmed sent us some pictures to share with you. We were so delighted to write back with thanks. Thank you so much for the news and thank you so much for the photographs. We hope soon we can work directly with you and the clinic. We are still trying to get the legal framework completed for The Giza Foundation, and then we can begin working. We would like it very much if this horse was not working until it gets better. It is so thin from when we saw it. We are afraid it will die before it gets better. I am going to put out an appeal on the internet for money to be sent to your clinic so this horse is well fed and does not have to work. Also I would like you please to give permission to use your news and pictures on the website to try and help bring money to the clinic. Can you EMail me to say if you agree to this please. The Brooke Egypt is looking forward to working with you too. We sincerely appreciate your offer and all the best wishes with getting the legal framework done. 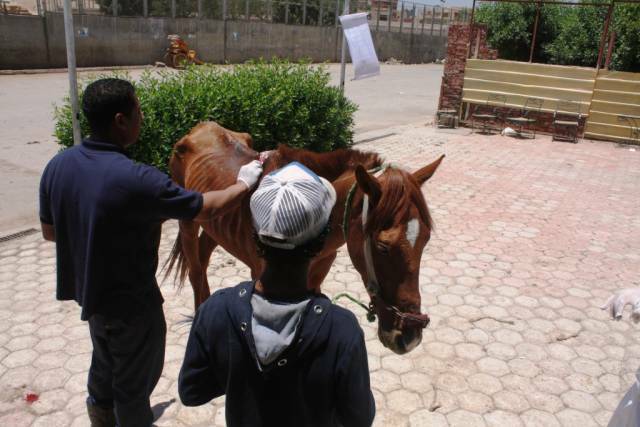 For your information, the Brooke vet offered the owner of the stable to bring the horse for the Cairo hospital where the horse can receive the best care as an inpatient. We really hope for the owner to respond and bring the horse. Will let you know if this happened. In case if not having the horse hospitalized, we are very much expecting the case to get better if the owner followed the Brooke vet’s advice to keep the horse rested and bring him to the mobile clinic regularly. We are surely happy for you to use the story and images on your respected website. We’d appreciate it if you can share the post with us when it’s live and also if you can include our website address (www.thebrookeegypt.org) so that viewers can get more information about our work and have all key contact details. Please let me know if this is possible. We say thank you to all concerned for the best likely outcome from this story. Thank you to Fran Pickering for bothering to pursue the story and thank you to Ahmed and the staff of The Brooke for dealing with the situation. We hope the success will be repeated over and over in the future. 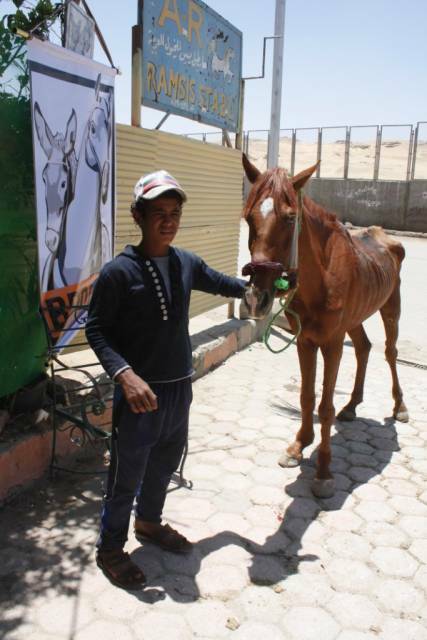 Ahmed finds the horse and returns nearby to the Clinic for its urgent treatment. Here - showing the required pressure relief pad. 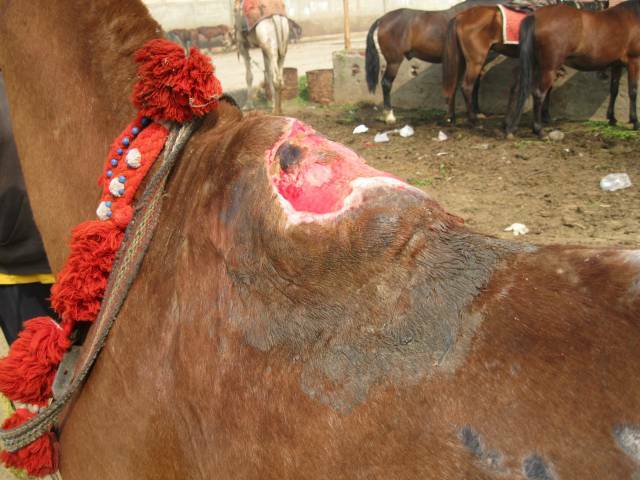 The ulcer is smaller, but look how the condition of the horse has deteriorated. This horse was still being worked with tourists. Its suffering for so long is beyond belief !! We will keep you updated with the progress of this animal, but there are thousands of other starving, wounded and suffering animals ....hidden from tourists in plain sight. 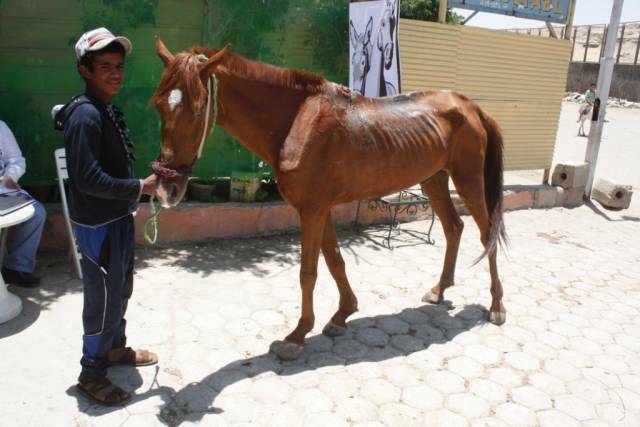 Donate all you can when you see a clinic at work, or via our internet appeals.... but PLEASE if you are in Cairo and you see a thin, weak or possibly wounded animal.... never add to the cruelty by taking a ride on it. and intervene with Police if you see cruelty !! ..And don't forget you can leave your thoughts and comments on the Guest Book at the bottom of our Index page.